Ron Perlman is 6' 1" (1.85 m) and is an American film and voice actor who was born on April 13, 1950 in Washington Heights, New York, USA. His birth name is Ronald Francis Perlman and is born to mother Dorothy, who was a municipal employee and is retired from the City Clerk's Office. His father was a jazz drummer and repairman and is now deceased. He graduated George Washington High School in 1971 and then attended Lehman College in New York City in 1971. He is from a Jewish family, and he was very close with his father. His father saw him performing in a college show named “Guys and Dolls” and told Ron "You have to do this... You understand this? You gotta do this." Ron said that his father gave him his blessings and permission to become an actor. He graduated from the University of Minnesota with a master's degree in Fine Arts for Theatre on July 20, 1973. He married fashion designer (now jewelry designer) Opal Stone Perlman on February 14, 1981 and they have two children together. Their daughter, Blake Amanda was born in 1984, and their son, Brandon Avery was born in 1990. Ron and his family reside in Los Angeles, California with their terrier dog named Nigel. Ron likes to play golf, pool and jazz. Ron’s career began as a stage actor, and his first movie appearance was in Quest for Fire (1981) by Jean-Jacques Annaud. He is best known and won a Golden Globe (in 1989) for his role in 1987 TV series Beauty and the Beast. He is also known for The Name of the Rose (1986), Romeo is Bleeding (1993), The Adventures of Huck Finn (1993), Police Academy: Mission to Moscow (1994), The Last Supper (1995), The Island of Dr. Moreau (1996), Alien Resurrection (1997), Enemy at the Gates (2001), Blade II (2002), Star Trek Nemesis (2002), Hellboy (2004) and Hellboy II: The Golden Army (2008). His first leading role in a movie was in French movie, The City of Lost Children. His best known television appearance are in Highlander: The Series, Sons of Anarchy, The Outer Limits and The Magnificent Seven. He was in two of Stephen King’s movie adaptations from his books, Sleepwalkers and Desperation. 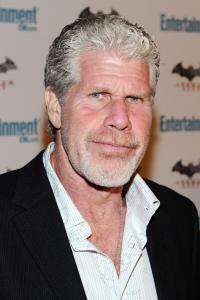 Some famous actors Ron Perlman has worked with are Ed Harris, Elijah Wood, Marlon Brando, Federico Luppi, Michael Wincott, Brad Dourif , Sean Connery, Dominique Pinon, Sigourney Weaver, John Hurt , Jude Law and Christina Ricci. He is left handed but was forced to use his right hand as a child, and he can now use both hands comfortably. He loves the New York Yankees and is a huge fan. His favorite movie is Nobody’s Fool (1994). He was the oldest actor in 2008 at age 58 to play a main superhero. He was a superhero in Hellboy II: The Golden Army.